Archipelago International once again held its biannual Sales & Marketing Conference in Bali. Attended by more than 160 leaders from across Indonesia and Malaysia, this years theme covered the topic, Balancing Online and Offline Business. Archipelago International recently announced the signing of a new Harper Hotel in Medan. Set to open in early 2019, the hotel will be the seventh Harper in Indonesia, joining Harpers in Jakarta, Bali, Makassar, Purwakarta, Yogyakarta, and Cikarang. Archipelago International, a leading Indonesia-based hospitality management company, has received the ISO 14001:2015 certification for implementation of Environmental Management Systems (EMS) and OHSAS 18001:2007 for developing Occupational Health and Safety (OH&S) management systems in compliance with the international standards. 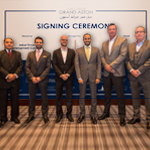 Archipelago International, Indonesias largest hotel group, today announced the signing of a long-term Master Franchise Agreement, with Jeddah based Warifat Hospitality Limited, a subsidiary of Jabal Omar Development Company (JODC), one of the largest listed companies on the Saudi Tadawul Stock Exchange. Following the success of Jakartas recent anniversary and Bandungs anniversary celebrations last year, Archipelago International once again held various exciting events across the city to honor Bandungs 208th-anniversary last month, from culinary creations to flower planting, city tours, and special discounts.